The new iPod touch ( ) is going to be a popular present for the upcoming holiday season. If you’re planning on giving (or getting) a new iPod touch, invest a few dollars in a case to protect the iPod during everyday use. 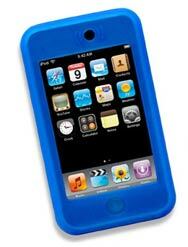 Here are a two silicone iPod touch cases that protect and add some grip. Back in August, I looked at the FlexGrip ( ) for the original iPod touch. The new FlexGrip for the new iPod touch is quite different from the previous model. Gone is the two-tone design and the nubs that covered the back of the case. The new FlexGrip is now a single color, with raised surfaces along the back, highlighted by wavy stripes—it’s a more sophisticated look. The new design is not as grippy on a car dashboard as the previous FlexGrip’s nubs, but in your hand, the new design works fine. The other major design difference is that the old FlexGrip covered the top part of the iPod touch face, stopping before the screen, and leaving a hole for the antenna. The top of the new FlexGrip covers about half of the top area of the iPod touch face, stopping before the antenna area. Fortunately, the included clear screen protector doesn’t just cover the screen, but the whole front of the iPod touch, providing protection for the area no longer covered by the silicone case. You also get a small cleaning cloth. Like the previous FlexGrip, the new model held up well with everyday use. The FlexGrip is available in a $20 two-pack that includes a red case with black stripes, and a black case with gray stripe. A pretty good deal. The TopSkin for iPod touch is much like PDO’s TopSkin for iPhone. There are nubs for the volume and Sleep/Wake switch, openings for the screen and antenna, and cut-out flaps that cover the dock-connector port and the headphone jack when not in use. (Before I tested the TopSkin, I decided to give my iPod touch’s dock-connector port a close look, and I was amazed and the amount of pocket lint caught in there. A flap like the one on the TopSkin will help keep the port tidy.) The flaps easily move out of the way when you want to connect an accessory or your headphones. On the other hand, it’s a little tricky to move the dock-connector flap out of the way when inserting a TopSkin-encased iPod into a dock-cradle accessory (but it can be done). Overall, the TopSkin is a very good silicone case; the silicone is thick enough to protect without adding a lot of bulk, and also adds a nice grip to the iPod touch. PDO includes a clear plastic screen protector that didn’t hinder my ability to use the iPod touch screen. The TopSkin is available in black, blue, red, and white.